1. 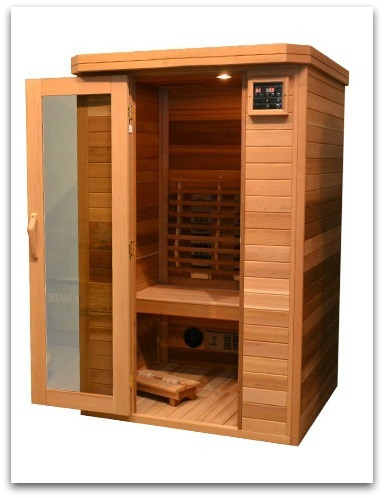 A COMFORTABLE SAUNA EXPERIENCE – Heats moisture in the body to comfortably penetrate heat deep into the core of the body. 2. CALORIE BURN – Metabolize up to 600 calories per sauna session. 3. PAIN RELIEF – Relieve tension and soreness in all 400+ muscles and 200+ joints in your body in just minutes! 4. DETOXIFY – Efficiently cleanses the lymphatic (immune) system of heavy metals, chemicals and toxins. 5. FEEL HUGGED – 96% Far Infrared bathes you in warmth and comfort similar to sunlight, but without the UV. 6. LIFT YOUR SPIRITS – Far Infrared frequencies stimulate “happy hormones” in the glandular system to relieve stress, fatigue and depression.